This versatile DC-DC boost power supply/converter module steps up any input voltage from 10V to 32V to any output voltage from 12V to 35V at up to 150W output power and 6A current. 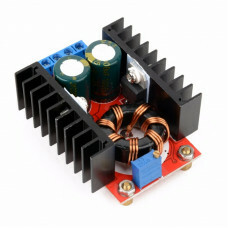 This 150W DC-DC Boost Converter 10-32V to 12-35V 6A Step-Up Adjustable Power Supply is well into the heavy-duty end of the spectrum @ 150W; as you can tell by the huge toroidal inductor and dual heatsinks. Please note there is no reverse polarity protection. A series diode is recommended. For high loads this might not be an option; so be cautious of the input polarity or you might fry the module! Universal car laptop power supply. Provide 12V input, the output voltage is adjustable to your notebook to work. Can easily drive dual-core or quad-core notebooks at 19V and up to 6A output current. Power supply for your electronic devices, as long as the voltage is adjusted to the voltage and does not exceed the module’s rated current. Set the output voltage to the desired level using a voltmeter before connecting it to your equipment or load.